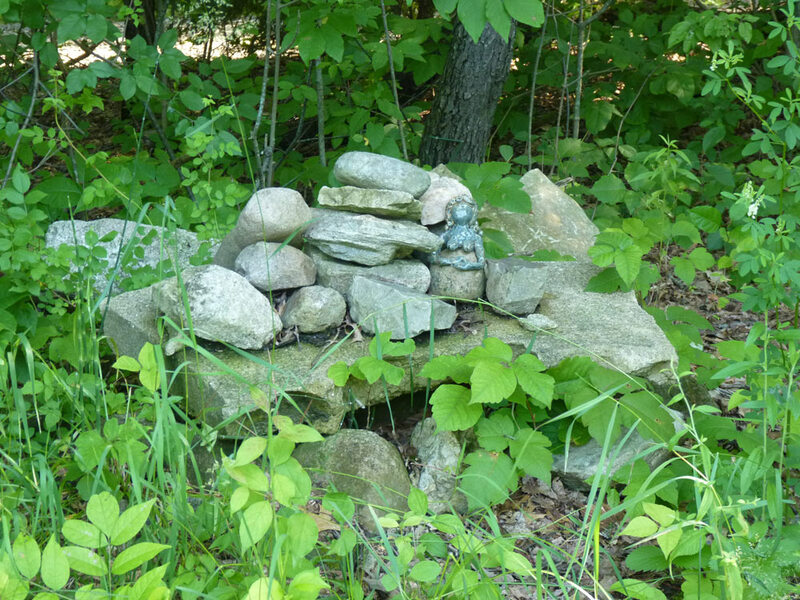 Offerings to the land, spirits, and/or diety are a common stable in many traditions, druidry being no exception. Many opportunities present themselves and having something you carry with you can be built into your regular druid practice (and kept within, say, a crane bag). Some years ago, I wrote about sustainable offerings and the kinds of offerings you can leave as part of a regular spiritual practice. These offerings might be home-grown herbs (as in the case of today’s post), home-brewed alcohol, small blessed stones, home baked bread or cakes, small shells, even your own nitrogen-rich urine. I think the important thing with any offering is that it truly puts no strain on the ecosystem–but rather, is a true blessing. 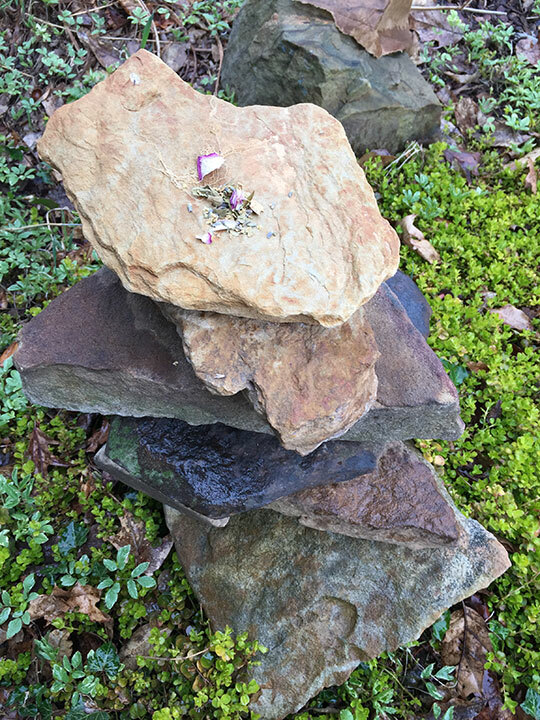 In the spirit of this idea of sustainable and sacred offerings, in today’s post, I’ll share the recipe for one of my own sacred herbal blends that I often carry with me and use for leaving small offerings—in nooks of trees, on stones, in an offering bowl, as an offering as part of ritual, and so on. 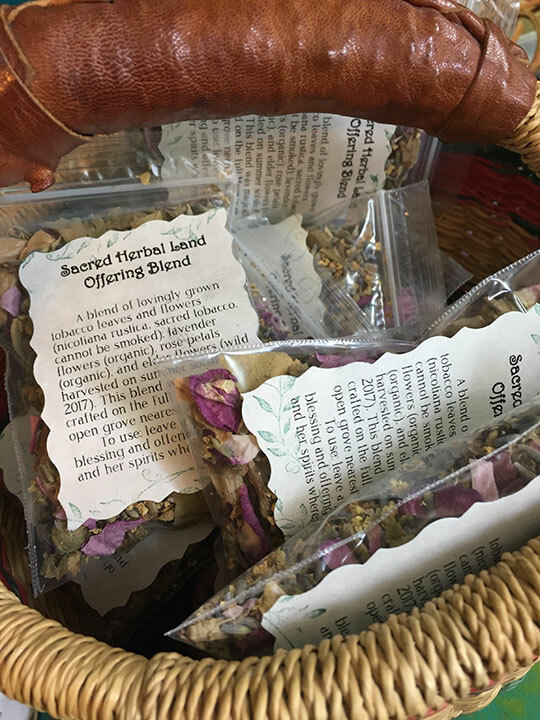 This kind of offering blend is a perfect thing to make at Beltane, as the energy of Beltane is full of vitality and life, of healing and blessing. 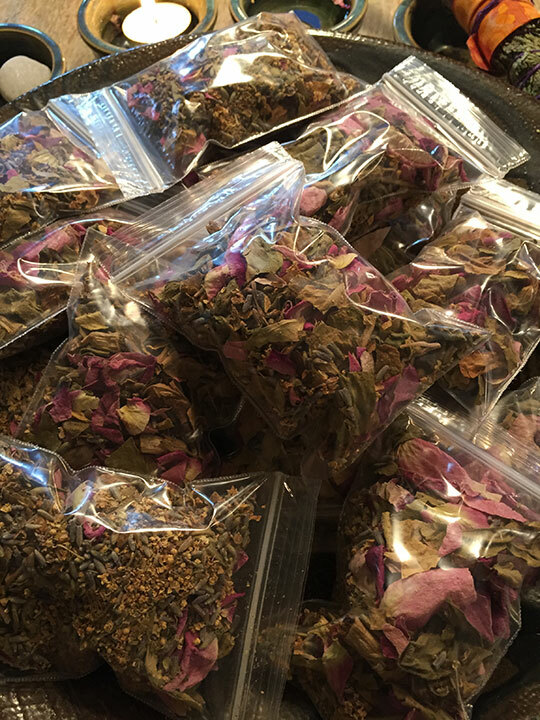 Using the energy of Beltane to mix and bless these herbs brings that energy to the land and spirits throughout the year. The key to leaving any offering is that it won’t damage the ecosystem or cause it harm–either in the leaving of said offering or in its creation. This means you have to take some serious care and consideration to develop an offering blend that gives back rather than takes. In the case of the herbal offerings I’m talking about today, it is critical that you leave only materials that will naturally break down and that will not spread any seeds that do not belong in the ecosystem. 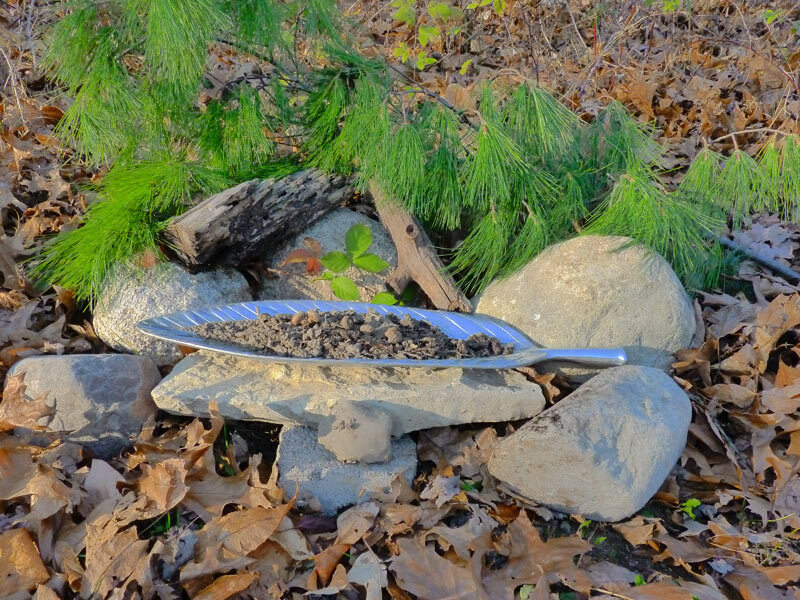 An alternative, another kind of herbal offering entirely, which I’ve talked about in some of my wildtending posts, is to intentionally leave seeds that are rare and in need of replanting–but that’s a different kind of thing–you can read more about that in this post. That is certainly another kind of herbal offering that you can leave. 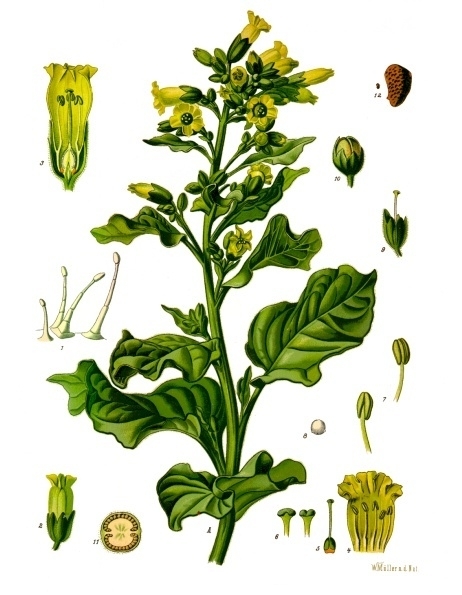 Nicotiana Rustica, or Wild Tobacco. Each year, I grow Nicotiana Rustica, which is an old form of tobacco known as “Aztec Tobacco” or “Wild Tobacco.” I’ve grown it successfully in a garden as well as in smaller pots in a windowsill. It is super easy to grow and grows prolifically. It will self seed if you allow it to. Wild Tobacco is not a kind of tobacco used for smoking as it has up to nine times the concentration of nicotine compared to a traditional tobacco grown for smoking (although in some parts of South America, Shamans use it as part of entheogenic mixtures). I have found that this particular strain of tobacco is well received by the spirits of the land and they are joyful in receiving it. This variety is native to North America, but is usually not cultivated because it is too potent for the common misuses of tobacco today. 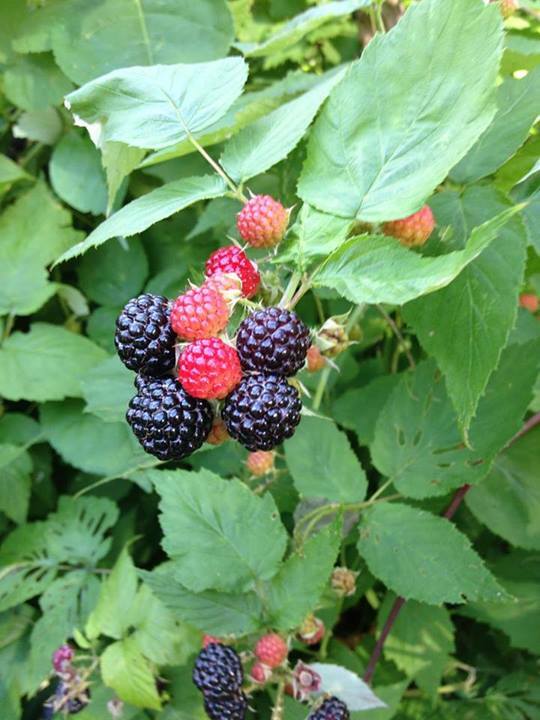 By growing this plant myself, and, by being a non-smoker, I am cultivating a sacred relationship with a plant that has long been used as an offering here on the land in North America–and a plant that is often well received when given in reverence and respect to the spirits and the land. I feel, in some way, that I am reclaiming a relationship with this tobacco plant, returning it to its sacred, rather than its mundane and abused, purpose. It is still early in the year, and you can readily get seeds for this variety–so consider cultivating some! I like to gather the flowers as they bud–each little stalk will produce a new flower and drop it regularly, much like common mullein. I will typically gather up most of the flowers and later, seed pods (to share the seeds). And I will cut the stalks and allow the leaves to naturally dry (they slowly turn brown). I save the stalks for use in smudge sticks that are specifically created as “offering” and “blessing” sticks. Both the dried leaves and stalks smoulder nicely. In this blend, the wild tobacco represents an offering to the land that is sincere and represents a desire for continuing a sacred relationship with the land. 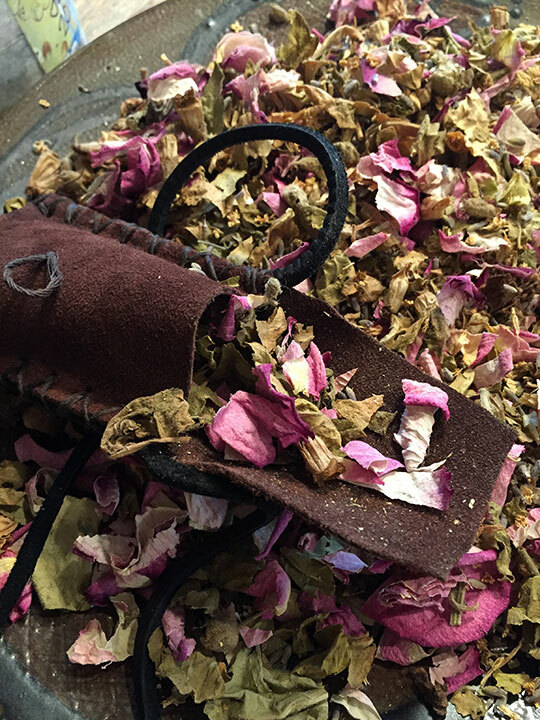 Rose / Rosa spp (flowers/petals): My second ingredient in this blend is rose petals–they produce a beautiful smell and color, and make the blend really delightful. However, they have a more important purpose, and that purpose is protective and healing in nature. Rose, medicinally speaking, helps heal the heart and also has thorns which offer protection. I gather rose petals around Lughnassadh each year (or earlier, depending on the specific species). Rose is under the dominion of Venus. Lavender (Lavandula spp). 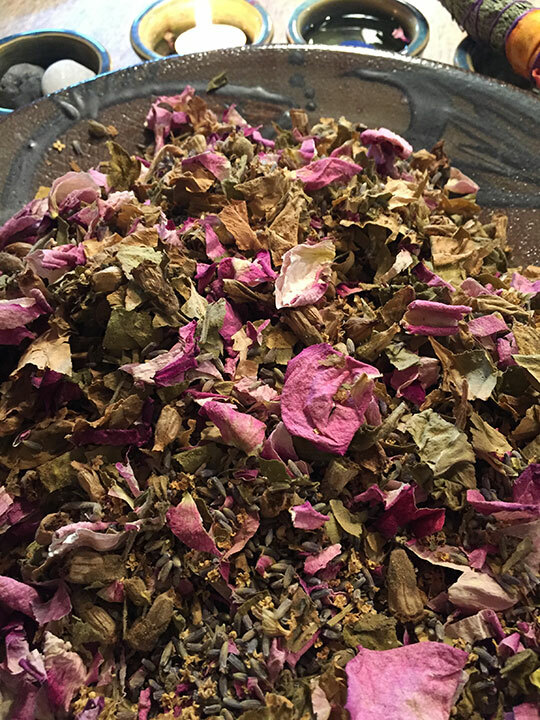 Lavender flowers are a third ingredient that comes in my sacred offering blend (and occasionally, lavender stalks and leaves, although I usually save these for smudge stick making as well). Lavender, which is a Mercury herb, has been used for millenia for purification and warding purposes–and that’s exactly what it is used for in this blend. Elder (flower, Sambuccus Canadensis; Sambuccus Spp.). I have written pretty extensively about elder in an earlier post, so you can find complete information on Elder in that post. In this blend, I gather Elderflower (right around or on the Summer Solstice). I turn much of this elder into Elderflower cordial and tea but save some of it for my sacred offering blend. 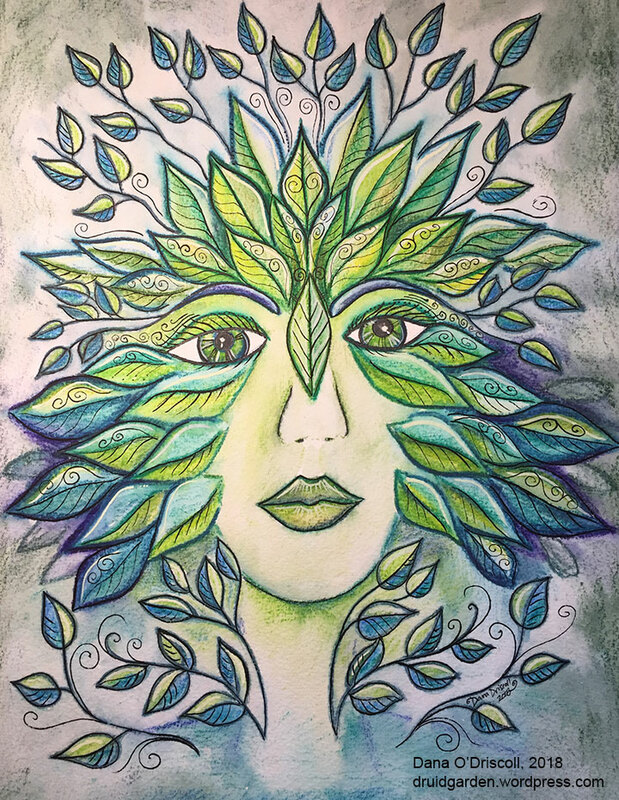 Elder offers a connection to the realm of spirit and for bringing good energy into the land through the connection with the summer solstice and solar current. Conifers: Eastern White Cedar, White Pine, Eastern Hemlock (needles), Spruces, etc. Other tree leaves would also be fine! The key to any blend is that you think about the magical purpose and energy behind each herb/plant/tree as well as your own relationship with it. This is a great way to begin to cultivate relationships with certain plants for certain purposes as well. If you “grow your offerings” this season, by the end of the year when you are ready to make such a blend, you’ll have spent a full season with that plant. If the plant is a perennial or you save some of the seeds, then your relationship with that plant deepens over the years. For example, I’ve been growing Nicotiana Rustica for about 8 years now, and each year, as I save the seeds and replant them, and share them with friends, my relationship with this plant deepens–and the power of the offering I give also deepens. To me, every part of the cultivating and harvesting of this sacred blend is, in fact, part of the sacred relationship I am cultivating with nature. By tending the plants, or finding them carefully in the wilds, I can continue to build a specific blend that honors the land our deepens our relationship. Select a sacred time. In my case, I decided to make this blend on the full moon closest to Beltane. This draws both on the power of the moon and the energy of the sun. 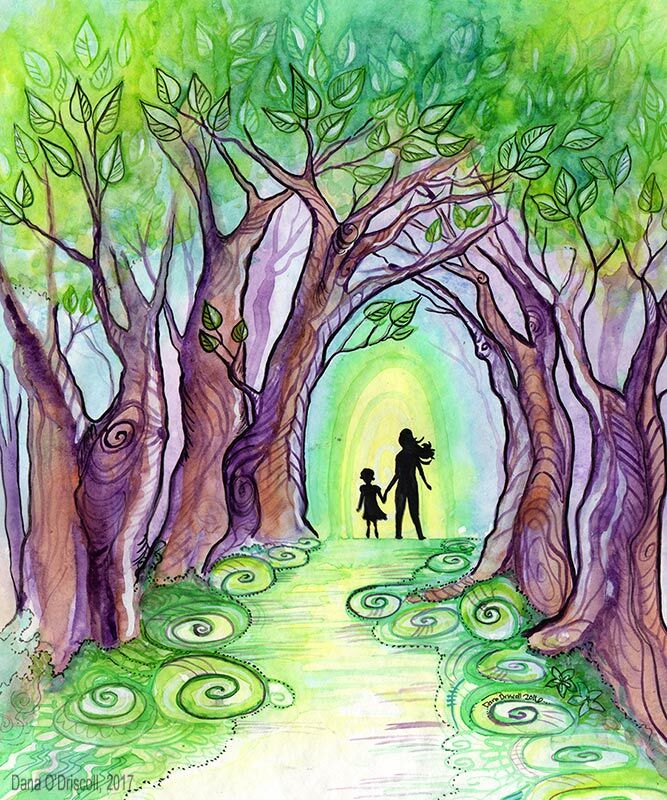 Open a sacred grove. In the druid revival tradition, this would include calling in the sacred animals, calling in the elements, blessing/purifying with the elements, saying the druid’s prayer, establishing a protective sphere or circle. Cut your Herbs (if necessary). Many home grown herbs are not in very small pieces, so I find it is useful to cut them. I do this with a pair of scissors. Blend Your Herbs. Gather your herbs together and blend them. I find that using a clockwise motion while I chant or sing helps bless them and brings some of my own energy into the mixture. Bless Your Herbs. 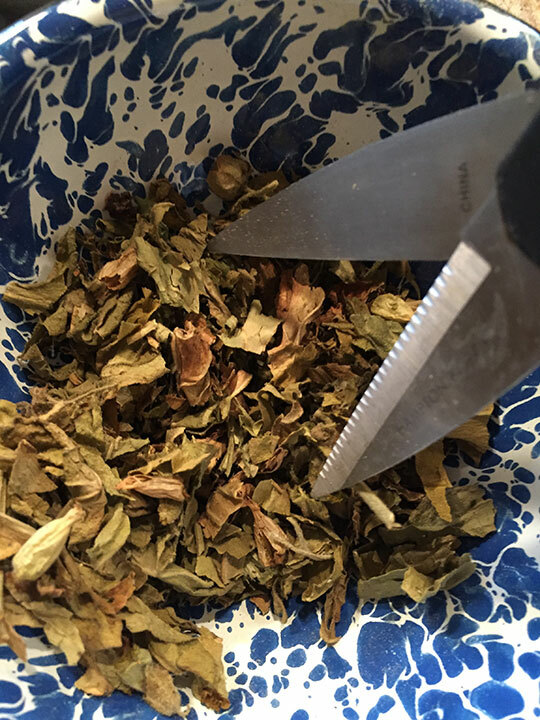 You might use a simple blessing to empower the herbs further with sacred intent. 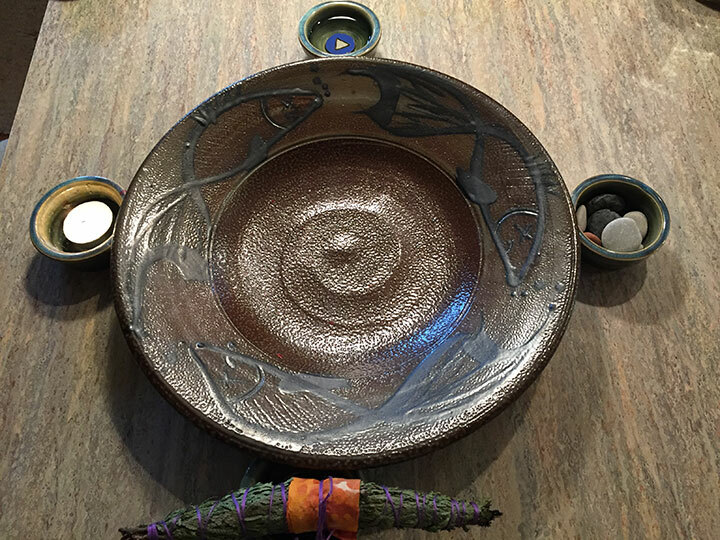 I used an elemental blessing, drawing upon the energies already called and simply moving each elemental bowl clockwise above the herbal blend. Store Your Blend. Depending on what you are going to do next, you might put your herbal blend in a mason jar to keep it airtight. The last batch I blended was primarily for gifts, so I instead put them in little bags with labels and also filled up my own offering bag again. Close Your Sacred Space. Close your sacred space once your magical crafting is complete! There’s not really a wrong way to use an herbal offering, but I can give you some ideas of how I’ve used these. Land Healing Purposes. When I see land in need of healing–an abandoned lot, a tree that has been cut down, a recently poisoned lawn, I will leave a pinch of the offering. This is just to let the land know that I am here, I honor it, and I am present. I have left these pinches near cut Christmas trees during the holiday season–again, as a space holding gesture. Land Blessing Purposes. When I’m interacting with the land, I will leave a pinch. For example, if I’m camping out somewhere, when I first arrive and again when I leave, I will leave a pinch of the offering. If I’m hiking, I will leave some as a I walk at a few points. Ritual Offering Purposes. 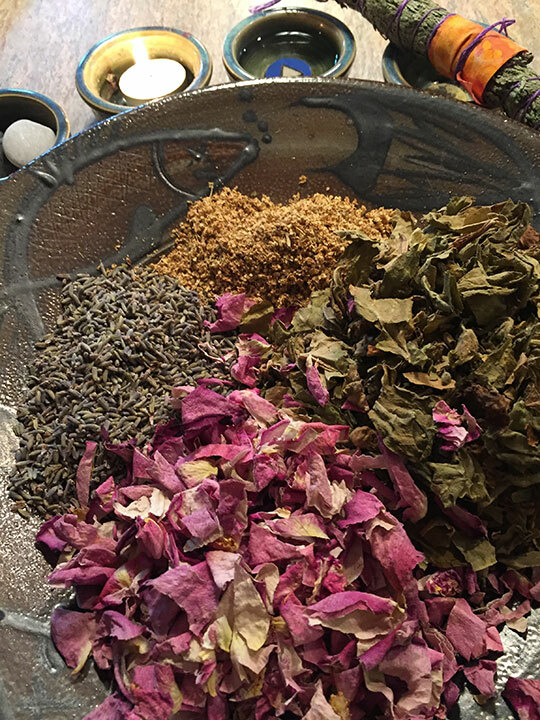 Because I always honor the land and the spirits of the land as a primary part of my own ritual work, I use this blend as an offering to the land. You can do a lot of things with this sacred blend–or another like it! I wish you a blessed Beltane–and happy magical crafting!